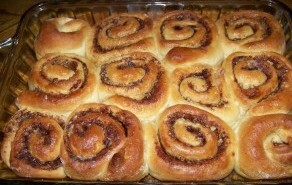 These Cinnamon Rolls are easy to make and are a favorite with the kids and hubby! For filling: cream together with mixer. Mix in dough mixer on low speed, adding the flour a little at a time. Continue mixing until dough clings to hook and cleans sides of bowl. rectangle about ½ inch thick on a floured surface. the entire surface of the rectangle. Cut into ¾ inch slices. Place on an ungreased cookie sheet about an inch apart. Let rise in a warm draft free place until double or about an hour. Bake at 350º until golden brown. Cool and frost with butter cream or cream cheese frosting.